Would you like to learn how to create your own fruit trees? Would you like to create a tree that grows more than one variety of fruit? Well, now you can. MidFEx will teach you how to graft! Grafting is a method of combining compatible plants to form a new plant. MidFEx conducts yearly grafting workshops to teach you how to graft. We have done this for over 30 years. Also, we have video demonstrations and our forum will give you access to experienced grafters to answer your questions. Is dwarf tree fruit different? Dwarf vs. full size tree? Where can I find more grafting information? What variety of fruit tree do I have? How can I protect my trees from pests? 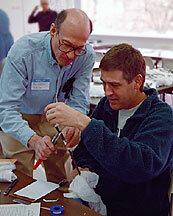 For more than 30 years MidFEx has been presenting grafting workshops in the Chicagoland area. It’s where our more experienced members pass on their knowledge of grafting fruit trees, free of charge, to all comers. Grafting is a surefire method of producing a tree whose fruit will be identical to its parents. Join us at our grafting workshop and create your own apple, pear or plum tree. This is definitely a hands-on workshop. You can buy rootstock at our workshop, follow along with the demonstration, and leave with one or more fruit trees ready to plant in the ground. Costs: Our workshop and guidance are free. However you will need to buy rootstock if you want to take home a tree. We will have dwarfing apple, pear and plum rootstock available. Cost is $5 each with free scion wood for MidFEx members. Non-members pricing is $5 which includes two pieces of scion wood of their choice. Grafting requires a very sharp knife with a 2-3 inch blade. Grafting knives will be available for $18 for those that don’t bring a knife or who find that their knife isn’t up to the task. Important: Regretfully, space is limited. Only the individuals actually grafting fruit trees will be allowed in the grafting classroom. Friends, spouses, and children are welcome to explore the grounds during the sessions.